The O’Brien children gather around Catie (front, center). In between radiation and chemotherapy, Catie came home from St Jude Children’s Research Hospital and the family spent a few days at the beach together. On a January day in 2009, 7-year-old Catie listened to her father, Kevin O'Brien, speak on the radio as part of a fund-raiser for St. Jude Children's Research Hospital. In the months before, the Pennsylvania girl had joined forces with the staff at the Tennessee hospital to battle against the tumor that invaded the base of her spine. Thirty-one rounds of radiation, plus high-dose chemotherapy. But six months after the tumor was removed, the cancer came back. Catie went home to Mechanicsburg, Pa., a small town eight miles west of Harrisburg, to spend the time she had left with her mother, father, and five siblings. It would be the last Christmas they celebrated together. Listening to her father on that January afternoon, Catie was thoughtful and calm as she made what would be one of her very last requests: "Do what you can for St. Jude," said Catie, who died two days later. "If you can do anything to help the next kid, the next family that comes along, do whatever you can." "We took her at her word," O'Brien said. In the eight years since Catie's death, the O'Briens, along with other parents, have become substantial contributors to a shift toward more family-centered care at St. Jude. That includes an expansion of palliative care, which aims to alleviate suffering, increase comfort, and improve quality of life. Halloween 2008 at St. Jude: Molly, Max, Catie, Maggie, who is holding Mary Elizabeth, and Mia. "They have been a major part in helping us change the culture," Justin Baker, St. Jude's division chief of Quality of Life and Palliative Care, said of the O'Briens, who were early, active members of the hospital's parent steering council. The O'Briens have also played an important role in St. Jude's initiative to train medical staff on how to communicate with and assist family members who lost their children. In workshops, medical personnel delve into sensitive topics such as discussing diagnosis and treatment, or delivering bad news to a family. At St. Jude, all oncology fellows and staff nurses are trained by parents of former patients. The O'Briens alone have helped train more than 300 staff members, Baker said. O'Brien said his wife travels to St. Jude in Memphis once or twice a month to conduct training. St. Jude has also developed mentoring programs for parents whose children are in treatment. Other hospitals have similar programs. In addition, the hospital has a bereaved parent mentor program with about 25 mentors, including the O'Briens, who offer support to every St. Jude family who has lost a child to illness. That support can continue for up to two years. Initially, Baker said, there was trepidation about asking the bereaved parents to serve as mentors. But the program's impact was obvious. "What we've learned in these last seven years of working with bereaved parents is that by not engaging them, we're taking away an opportunity for further healing," Baker said. O'Brien, an executive with Rite Aid, knows firsthand how this kind of service can help parents who have lost a child. "It's a way of keeping that legacy alive and a way to honor that child," he said. The family has also started the Catie's Wish Foundation, after Catie's request that they raise funds for St. Jude to help other children. 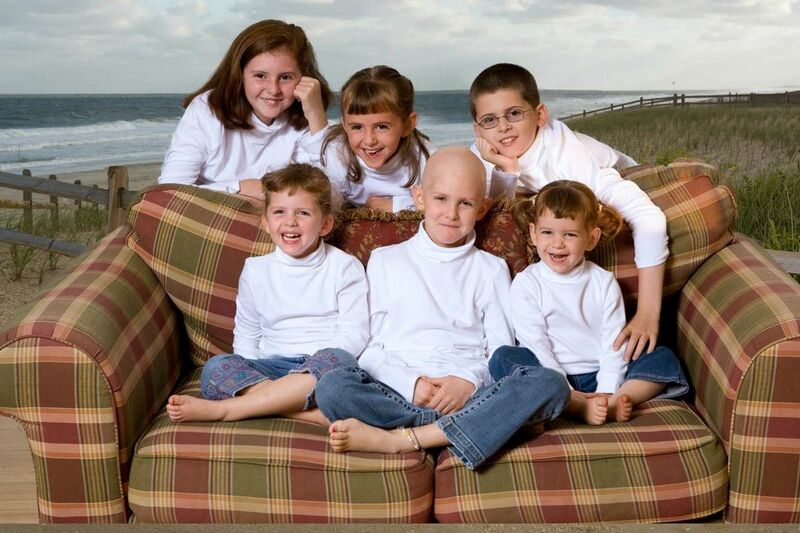 To date, more than $5 million has been raised in Catie's name. The O’Brien family in 2010 at the “Day of Remembrance” in the Danny and Rose Marie Thomas Memorial garden at St. Jude. Catie's siblings took her request to heart, as well. Maggie, the oldest of the five remaining siblings, is now a nursing student at DeSales University. Her inspiration was her memory of how the nurses at St. Jude looked after her sister. "The way the nurses cared for her and the strength they possessed was inspiring, I knew that was what I wanted to do in the future," Maggie said. Max is a student of the University of Pittsburgh and intends to be a Marine, his own form of service, his father said. On Oct. 13, Catie's three younger sisters traveled to Memphis with their parents to take part in St. Jude's 18th annual Day of Remembrance, a time to honor loved ones who have been lost. "They're a resource for other siblings going through it," O'Brien said. "They're there to hang out with the kids, do face-painting, to help kids out." And in doing so, they honored Catie's wish, too.